On that day in May, Zuckerberg announced that the privately held social networking site he founded in 2004 would open to third-party developers, transforming itself from a popular website to a platform on which other businesses can operate. Eight months later, more than 14,000 applications from third-party developers are live on Facebook, allowing users to do everything from flirt to browse for books. The most successful are raking in profits from ad revenues. Is Facebook becoming the social operating system of the Internet, poised to support a whole new generation of businesses? Or is this new industry of applications leaning too heavily on the quixotic popularity of a single website? Industry leaders and Wharton experts see major opportunities ahead for those who can manage the risks. For the moment, however, Facebook is “king of the hill” as a social networking platform and will be for some time, according to Peter Fader, a Wharton marketing professor. While MySpace is bigger, currently the third-most-popular site in the U.S., compared to Facebook’s rank of fifth, it has not yet opened to third-party developers (although owner Rupert Murdoch has announced intentions to do so). “Facebook is like the QWERTY keyboard: There’s nothing particularly special about it, but it came along at the right time and place. At some point that standard just becomes locked in,” says Fader. What makes Facebook attractive as a platform for businesses is obvious, says Kendall Whitehouse, senior director of IT for Wharton. “It brings in this huge audience from the get-go and you have a built-in infrastructure [for online interactions], so you get the network effect in spades.” The payoff for Facebook? Rich interactive content that keeps eyeballs on the site, and an entire world of developers competing with each other to create newer and better applications, says Whitehouse. But such enthusiast-entrepreneurs are just one group climbing onto the Facebook platform, says Fader. For already established companies, making a Facebook application is a way to “stand up on a mountaintop and shout.” In that category are applications tied into real-life products, like the popular game “Parking Wars” created by A&E Television Networks to advertise a new series about the Philadelphia Parking Authority. This “advergame” allows Facebook users to “park” cars on one another’s profiles and earn virtual cash by ticketing illegally parked vehicles. Jayant and Rajat Agarwalla are typical in many ways of Facebook entrepreneurs. The Kolkata, India-based brothers first created a website for playing an online version of the word game Scrabble several years ago “just for the love of the game,” says Jayant, 21, who also runs an offshore web development firm with his brother. The website attracted about 3,000 regular players. When an American user suggested the brothers launch a Facebook version of the game, they spent 10 days cooking up the application and then launched it in July 2007. With this small investment, the brothers were suddenly owners of one of Facebook’s biggest hits: Scrabulous. As of late January 2008, more than half-a-million Facebook users play Scrabulous daily, with four times that number having added the application to their Facebook profiles. Because third-party developers can keep all the revenue they generate, the Agarwallas are currently pulling in about $25,000 a month from advertising, according to Jayant, resulting in a “decent profit” after expenses like hosting, labor and server costs. In August 2007, Hasbro sold the digital rights to Scrabble and other games to the Redwood City, Calif.-based online gaming giant Electronic Arts (EA). 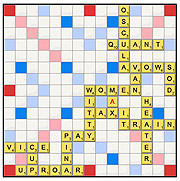 The following month, EA launched a version of Scrabble for mobile phones. Technology reviewers gave the game a thumbs-up except for one potentially fatal flaw: Users can only play with one another by physically passing the phone back and forth between them. Hasbro does have online multiplayer games. Users can download Monopoly, another Hasbro board game, for $19.95, but playing with friends is only possible if they buy the game as well. “I know so many venture capitalists and CEOs who play Scrabulous. It’s a new form of golf. Maybe you don’t have time to play nine holes, but you can socially interact and challenge one another via Scrabulous,” says Rumford, CEO of the Solana Beach, Calif.-based Gravitational Media and publisher of Facereviews.com, a review site for Facebook applications. Lerner’s company has since launched an even more popular application, “Are You Interested?” which allows users to find and express interest in other available singles. The application recently had about 600,000 daily active users. Lerner’s company has now changed its name to SNAP Interactive and is preparing to shut down its stand-alone dating website and concentrate full-time on developing Facebook applications. In comparison, two of the dominant players in online dating — eHarmony.com and Match.com — had Facebook applications with 48 daily active users between them on a recent day. And it’s not just on Facebook where the online-dating incumbents are losing out. According to comScore, a web analysis firm based in Reston, Va., traffic to stand-alone sites like eHarmony.com and Match.com fell 21% and 16%, respectively, between 2006 and 2007. Industry observers partly blame the allure of dating opportunities on free social networking sites like Facebook. Lerner’s SNAP Interactive receives extra attention in the Facebook business world because it is one of the few publicly held application-development companies. Its preliminary earnings report for the final quarter of 2007 showed revenues of $388,000 — a more than 10-fold increase over third-quarter revenues. In spite of such tremendous growth for application superstars, including the San Francisco-based Slide and San Mateo-based RockYou, Wharton’s Werbach asks whether the Facebook economy will remain on a micro-level for some time to come. “If you are starting a business that needs only a small revenue stream to support a few people, you can do that on Facebook, but to build a business that would become a public company, valuable enough to be a major acquisition — it’s not clear today there is enough opportunity,” says Werbach, founder of the Supernova technology conference. Those bullish on the Facebook market predict that people will conduct more and more of their online lives through social networking venues like Facebook. Styky Phonebook, an application developed by a Wharton undergraduate, for example, allows users to save and synchronize cell phone address books on Facebook pages. Other applications let users import their music libraries or feed in streams of content from outside blogs. And with Facebook planning to launch its own payment system, users will soon be able to shop online without ever leaving the cozy blue-and-white confines of their profile pages. “The apps currently on Facebook only scratch the surface of what’s possible,” writes Salil Deshpande of the Menlo Park, Calif.-based Bay Partners venture-capital firm in an e-mail. Deshpande, together with colleague Angela Strange, created AppFactory, a fast-track venture capital fund targeted solely at Facebook application developers. According to Deshpande, the fund has received several hundred applications and has funded six ventures, all with investments between $25,000 and $250,000. One key to scaling up the industry is “interoperability” among social platforms, says Wharton’s Werbach. With Facebook taking the lead, industry participants like Deshpande called on other social networks to make their platforms compatible with Facebook’s so that developers can deploy their applications on multiple platforms with a few clicks. Deshpande says he sees “momentum” in that direction. In early December 2007, for example, the popular social network Bebo announced an open application platform that works easily with Facebook applications. One month earlier, Google launched OpenSocial, a standardized applications platform which gained the support of most of the major social networking sites, except Facebook. Such compatibility may be essential for application developers to break into non-U.S. markets where Facebook is a less-known quantity.